Easter is a week away! Make a plan to share a meal with friends and family. Enjoy everything from the omelette of the the day to chicken biscuits at this Southie favorite! Treat yourself to their DIY Bloody Mary bar or order up a mimosa flight! Be on the lookout for some special Easter additions to their menu. You can learn more here! South Boston’s go-to brunch destination, Lincoln Tavern & Restaurant welcomes guests for a family-friendly Easter Brunch and Easter Dinner. With menu items fit for kiddos and adults, there’s something for the whole family to enjoy. In addition to Lincoln menu, guests can enjoy Easter special additions too! Have you tried brunch at Loco Taqueria and Oyster Bar yet? Put it on your Easter weekend list to do! Enjoy fish tacos, juevos con carne, enchiladas and of course some of the best margaritas around! For a full menu visit: their website! Roza Lyons is now serving brunch! Stop by this weekend and enjoy delicious brunch items like their Breakfast Burrito, Eggs Benedict, or the Lyons Omelet! Brunch is served from 10am-3pm on Saturday and Sunday! Don’t forget to order one of their amazing mimosas too! Brunch is served 9am-3pm at The Broadway! Feast on Pancakes Tacos, French Toast Sticks, Country Fried Biscuits, Breakfast Skillets and more! Don’t the BYOM – build your own mimosas and nitro draft espresso martinis! 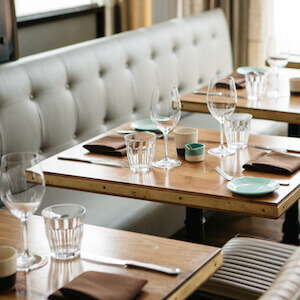 Gather – 75 Northern Ave.
Head to the Seaport District and enjoy brunch at Gather! Gather’s brunch menu features their legendary Chicken and Waffle Bites (life-changing), egg sandwiches, DIY Waffle Bar and a Roasted Turkey Club (we think the best around! )Gather will also have a few special additions just for mom like Spring Vegetable Risotto and Creme of Asparagus Soup! To make a reservation visit here! Enjoy the Mexican scramble, steak hash or french toast at the Playwright Brunch. Don’t forget to order their buffalo chicken dip and a boozy iced coffee! You can check out the full menu here! Fat Baby’s brunch features items like donuts, ramen, Szechuan dumplings, Korean fried chicken and waffle, and brunch bao. Brunch cocktails include a Bucket of Bubbles, Sake Sangria, the classic Mai Tai, and the Frosé will be flowing like….well…wine! Talk about perfect! Backyard Betty’s will fire up the grill early as it officially rolls out Sunday brunch service from 11am – 3pm. The refined retro restaurant known for cookout classics and regional, American comfort fare will serve up a creative spin on brunch, ranging from a modern take on breakfast favorites to their creative cookout-style cuisine. Behind the bar, the Betty’s team will be mixing up a special brunch treat in the form of Boozy Adult Cereal Shakes, inspired by favorite childhood cereals! Executive Chef Joel Howard’s brunch fare is served up every Sunday from 11am – 2pm in the restaurant’s rustic, mid-century dining room as well as outside in the 2,000 sq ft open-air atrium, garden space. The menu features Bag of Beignets (cinnamon sugar, mescal sabayon, $7,) Mahi Tacos (fried mahi, avocado, picco de gallo, cilantro, $15,) and Chilaquiles (tortillas, grilled salsa, fried eggs, crème fraiche, cilantro, avocado, $13,) among other breakfast-centric selections. Reservations are highly recommended! Mastro’s Ocean Club – 25 Fan Pier Blvd. Feeling like treating yourself? Mastro’s Ocean Club is offering their regular menu with items like Shrimp Cocktail, Twin Lobster Tails, Filet Mignon, and Alaska King Crab Black Truffle Gnocchi! They also have special additions like Maine Lobster Eggs Benedict, Jumbo Lump Crabcake Omelette, NY Strip Steak & Eggs, Croque Madame and Smoke Salmon with Bagel. Don’t forget to save room for their famous Butter Cake!